Azerbaijan has started production of tactical missiles. 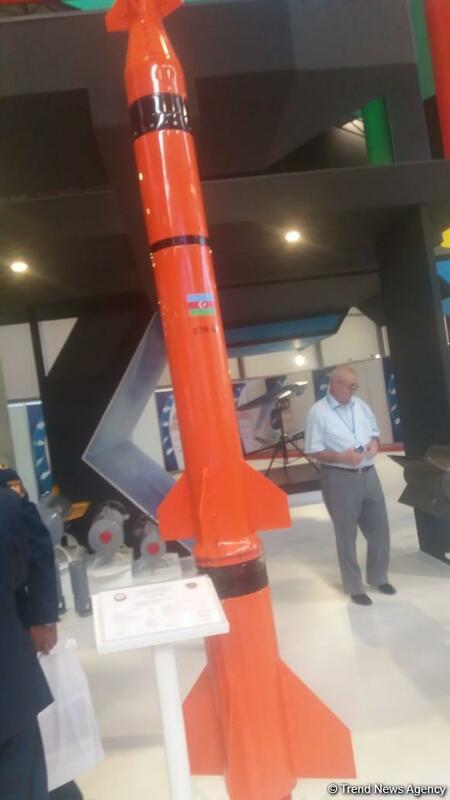 The experimental missile produced by the Defense Industry Ministry is being demonstrated at the 3rd Azerbaijan International Defense Exhibition ADEX 2018. The caliber of the missile is 203 millimeter and the weight of its warhead is 50 kilograms. The missile equipped with the INS GPS navigation system has the 1.1-second duration of its starting engine, while the duration of the main engine is 200 seconds. The range of the tactical missile is 10,000-50,000 meters, its length is 2.4 meters and weight – 250 kilograms. ADEX 2018 kicked off at the Baku Expo Centre on September 25 and will last until September 27. As many as 224 companies from 29 countries take part in the defense exhibition. The exhibition features 11 national stands of Azerbaijan, China, France, Iran, Israel, Russia, Serbia, Turkey, Belarus, Ukraine, Pakistan, and representing leading companies from these countries. The pavilions demonstrate modern weapons and equipment. During the exhibition, the industry professionals get acquainted with the new products of Azerbaijan’s defense industry and witness both the current and growing capabilities of the Azerbaijani Armed Forces. Azerbaijan leaves behind many CIS and regional countries to take its place among the first 53 strongest armies of the world, according to the Global Firepower survey center. The country, which is in war with neighboring Armenia over the latter's groundless territorial claims during more than 20 years, keeps in focus the armament. While creating its own armament, Azerbaijan works closely with leading companies in various fields of military industry.